You're receiving this newsletter because you visited the Tiare Films stand at a wedding show, or you signed-up at the Tiare Films website. Having trouble viewing this email? View it in your browser. Welcome to the Tiare Films newsletter. After wintering in Rarotonga, we are now back in Wellington and looking forward to the New Zealand wedding season. Over the past couple of months we've been filming in Rarotonga, Cook Islands. 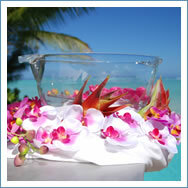 At the same time we also caught up with the leading wedding planners and resorts. We can confirm the Cooks reputation as the destination for couples seeking a tropical ceremony. Beach-side sunrise or sunset weddings are a popular choice, and the relaxed atmosphere is perfect when introducing family to friends. Venues range from informal, to upmarket - with catering and reception options to match. The details of your ceremony can be handled by a resort, or one of the growing number of professional independent wedding planners. The Cooks offer a wide selection of venues. We filmed a number of weddings while in Raro, and now have new edited highlights screening on our website. Mary and Api's sunset ceremony was held at a family bach on Aro'a (Lover's) Beach. The bride wore a Spanish-influenced gown with contrasting black hibiscus detailing; the groom's party wore black pareu and polos. Friends and family pitched in to prepare an umu (ground oven); with music, dancing and laughter continuing on into the night. Hannah and Shaun travelled from Kent, South England for a private sunrise ceremony at the stunning Rumours Luxury Villas. After their early morning nuptials, the couple enjoyed a day of relaxation and pampering including a massage and fine dining. Our edited highlight films are a 'condensed' version of the wedding film, included as part of our Paua and Pearl packages. We’d like to thank Mary & Api, and Hannah & Shaun for letting us share their weddings with you. Toward the end of our stay, we were drafted into covering the Va'a (outrigger canoe) events for the Pacific Mini Games Host Broadcast Unit. We traded our formal attire for sunscreen and hats as we filmed the sprints from scaffolding in the middle of Muri lagoon, then followed the marathon events along the reefline between Avarua Harbour and Muri Beach. Given the close ties between us and the Cook Islands, this is definitely a sport that we should see more of here in Aotearoa. Andy tracks the Cooks V6 men's va'a team as they head for home. Thank you to all of the couples that braved the weather last Sunday to visit us at the Spring Wellington Wedding Show. We hope you found inspiration for your wedding plans. If you need to track down the details of an exhibitor, The Wellington Wedding Show website provides a handy list of exhibitors, including links to their websites. We next exhibit at the North City Wedding and Bridal Expo. Sunday 24 January, 10am-4.30pm at the Te Rauparaha Arena in Porirua. Hope to see you there. We have collated the entries into our prize draw for free bride and groom preparation coverage. The winner has been drawn and Justine will be in touch shortly to confirm details. After the Spring Wedding Show the few remaining dates for the 2009/2010 season are filling fast. To arrange a consultation to talk about your wedding film, fill out our registration form or contact Justine Flanagan, +64 4 3800 800 / justine@tiarefilms.com. Thanks for reading our newsletter. If you have any questions about filming your wedding, or have feedback to our work, we'd love to hear from you. Subscription - sign-up to the Tiare Films newsletter email newsletter@tiarefilms.com. Pass it on - if you know someone planning their wedding, please forward them this newsletter. Get in touch - Tiare Films Contemporary Wedding Videography, 93 Rintoul St, Newtown, Wellington. +64 4 3800 800. tiarefilms.com. Justine captures the laughter of Hannah and Shaun's photoshoot.